Click on a state for more information! Nearly two-thirds of U.S. students live in states that have education standards influenced by the Framework for K-12 Science Education and/or the Next Generation Science Standards. Nineteen states and the District of Columbia (representing over 36% of U.S. students) have adopted the Next Generation Science Standards (NGSS). The 19 states are Arkansas, California, Connecticut, Delaware, Hawaii, Illinois, Iowa, Kansas, Kentucky, Maryland, Michigan, Nevada, New Hampshire, New Jersey, New Mexico, Oregon, Rhode Island, Vermont and Washington. 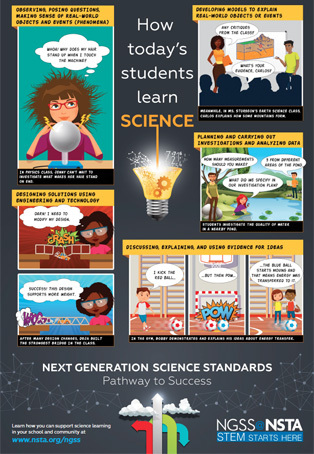 Twenty one states (representing 33% of U.S. students) have developed their own standards based on recommendations in the NRC Framework for K-12 Science Education. The 21 states are Alabama, Arizona, Colorado, Georgia, Idaho, Indiana, Louisiana, Massachusetts, Mississippi, Missouri, Montana, Nebraska, New York, Oklahoma, South Carolina, South Dakota, Tennessee, Utah, West Virginia, Wisconsin, and Wyoming. A vibrant conversation is always taking place on NSTA community networks. Discuss with colleagues, stay informed, and get answers on the NGSS listserv (members only), NGSS discussion board, NSTA blog, and Facebook.